The only thing scarier than a shark is a shark you can't even see. Lantern sharks, which are already known for their small size and bioluminescence, may have one more feature that can keep them safe in a perilous deep ocean environment: invisibility. One new study shows that these rare sharks actually have the ability to create an optical illusion that renders them visually undetectable to predators and prey. These sharks use their light-emitting capabilities in addition to their natural shimmer to create the illusion of light matching their surroundings. "The photophores replace the down-welling light from the sun, which is absorbed by the shark's body," lead author Julien Claes explained to Discovery News. "The silhouette of the shark therefore disappears when seen from below." The study, which will be published in the Journal of Experimental Marine Biology and Ecology, also confirmed new locations for finding this small fish, namely around Okinawa in Japan. Previously, these sharks had only been found in the waters off Taiwan and around southern Japan. 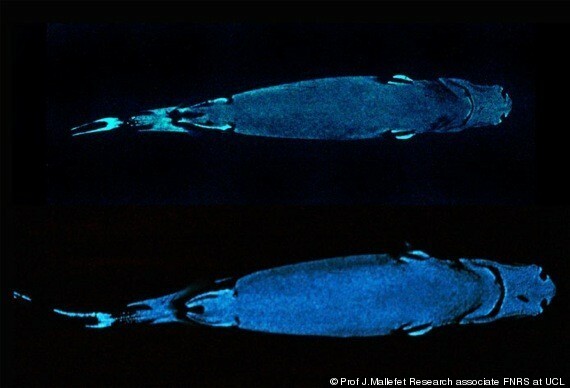 The first time scientists were able to study the bioluminescence of sharks in a scientific setting occurred in May 2010, when Claes and his team examined a different species of lantern shark. Researchers at the Catholic University of Louvain got an unprecedented up-close look at a different breed of the sharks, which are known by either their scientific name -- Etmopterus spinax, their common name -- the velvet belly lantern shark, or their street name -- "the phantom hunter of the fjords," according to Discovery News. These little sharks, reportedly no greater than two feet long, inhabit mainly Atlantic waters, including the Mediterranean Sea and the fjords of Scandinavia. According to the University, researcher Julien Claes became the first scientist to suggest that these sharks control their luminescence not only with nerves, but hormones as well. Many shark species are threatened by the fin trade and overfishing. Learn more here. UPDATE: The image below is courtesy of Professor Jerome Mallefet. He writes to The Huffington Post that he is "head of the marine biology laboratory where we studied the luminous shark with Julien Claes (he was my PhD student, now postdoc). The picture was taken in Norway while I was working with Julien... here is one picture showing one male and one female."